CHROME CLOTHING RACK - This heavy-duty garment rack allows you hang all of your items beautifully and with confidence. Because it has a chrome finish, the clothing rack is stylish, while still maintaining practicality. 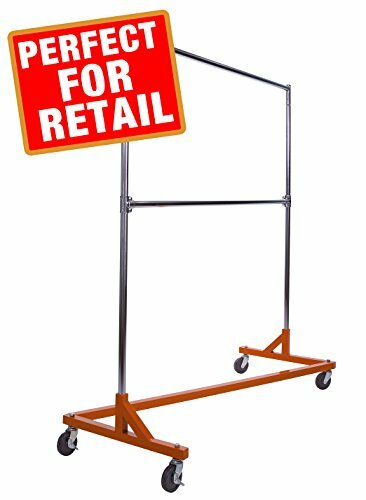 Z RACK - This rolling garment rack commercial grade comes with a z-base that makes it easy to assemble and great for storage. When not using the clothing rack, the z-base allows you to nest each rack, which permits for great storage, giving you ample space for other things. Also, the clothing rack is easy to put together, the z-base comes in three parts making assembly quick and easy. DURABLE & COLLAPSABLE - This commercial garment z rack has a z-base that comes in three parts. Easy to store, the rolling garment rack has 4" industrial casters. Made of steel, you can trust that the garment rack will remain sturdy during use. Completely collapsible and easy to store because of its z-base. EASY TO ASSEMBLE - The commercial garment rack is very easy to assemble making your job quick and easy. This garment rack comes with a three-part z-base that is simple to snap together. The rolling garment rack is also great for storage because of the z-base making your job easier when not in use.